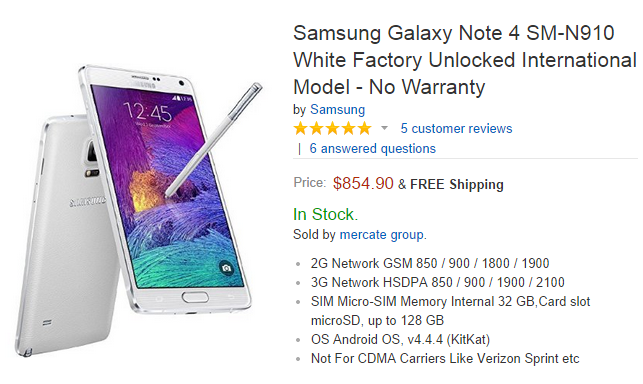 If you just can’t wait until next week, when all major US carriers will start selling the Samsung Galaxy Note 4, you can buy the handset right now from Amazon. They are selling the international 32GB model (SM-N910), with the black version priced at $859.94 and the white version at $854.90 . The gold version can also be purchased for $904.88, though that model will ship within 6 to 10 days, meaning you’re better off waiting for the official launch on October 17th. The phone also won’t work on CDMA networks like Verizon and Sprint. Unfortunately, Amazon isn’t offering a warranty on the device, which i am not surprised considering it will be an imported unit, though you can buy a 1-year drops & spills warranty for an extra $89.99. The Galaxy Note 4 is arguably one of the best extra-large smartphones that money can buy right now. It brings lots of improvements over the Note 3 from last year, including an enhanced display with 1440 x 2560 pixels, faster processor, better cameras (16 MP on the back, and 3.7 MP on the front), and a more useful S Pen stylus.